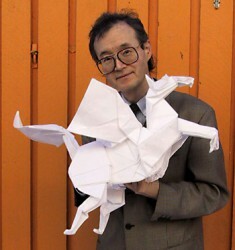 Norio Torimoto, born in Japan in 1948, is one of the most well known representatives of origami art. Since 1971, he has been represented in museums, exhibitions and participated in other events where Japanese culture has been the focus. Norio Torimoto won great fame in 1991 at the Nippon Origami Association World Exhibition and was appointed Origami Master by Nippon Origami Association in the year 2000. Norio has been involved in origami projects around the world in countries like the US, Hungary, China, Poland,Latvia,Italy, Germany and Sweden. In 1987, Norio was commissioned to create an origami panda, symbol of World Wildlife Foundation (WWF), and also had the honour to present the panda to his majesty King Carl XVI Gustaf of Sweden. Norio lives in Sweden and among his origami creations you will find figures like Nils on flying goose, Björn Borg, Boris Yeltsin, Olof Palme as well as the former Swedish Prime Minister Göran Persson. Extremely interested in mathematics, Norio lectures at The Royal Institute of Technology in Stockholm, several universities in Japan, Denmark and the UK with topics like “Origami – Geometric solution as visual tactile perception”. He also spends his days teaching both teachers and young kids advanced mathematics through his origami.In 2009 Norio designed the cover art for the Eniro telephone catalogs in Sweden.